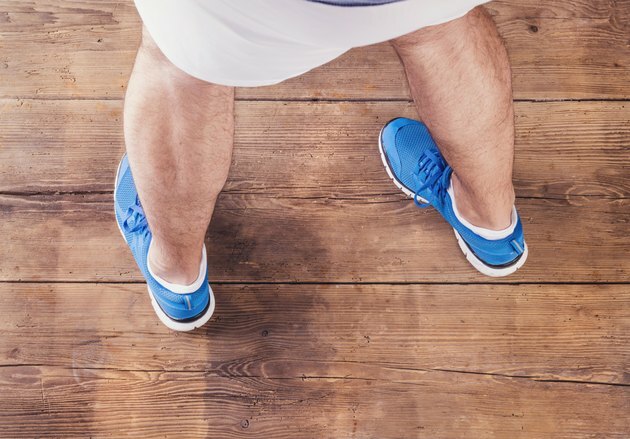 Exercise often puts your calves to work. This can sometimes lead to swelling in your calves, especially if you strain the muscles or injure them in some way. You can treat your calf muscle and even prevent swelling from returning with diligent care. Talk with your doctor if swelling doesn't go away on its own quickly or is painful. The calf is comprised of two muscles, the gastrocnemius and the soleus. The gastrocnemius is large and runs from above the knee to the heel. The soleus is smaller and attaches below the knee joint to the heel. Pain or swelling in the lower calf may indicate damage in the soleus. If the swelling is spread over the entire calf, it's likely the gastrocnemius. Calf muscle swelling can be caused by a variety of things. For instance, drastically modifying your exercise routine can cause swelling, especially if you increase the intensity of your running program or treadmill work. Failing to warm up, stretch and cool down can lead to muscle strain and swelling. Likewise, failing to maintain proper nutrition and hydration can cause your calves to swell. Calf muscle swelling is rarely a problem that occurs on its own; it usually occurs in conjunction with other symptoms. Aching and bruising can indicate a minor tear in the calf when accompanied by swelling. Sharp pains could indicate a more serious injury, however. You may have trouble walking without experiencing pain. In these cases, you should see a physician for an accurate diagnosis. To treat calf muscle swelling, immediately stop the exercise activity and rest. Elevate your leg and place ice on the muscle several times a day for no more than 20 minutes at a time. Perform mild stretches to encourage healing. Abstain from your workout routine for at least five days until the swelling and pain subside. If you have severe pain, don't stretch. Instead, see a doctor.